Hubby’s groan was intentionally loud when he saw me unpack the beige blob of cauliflower. He’s not a fan. I think of cauliflower as a vehicle for other flavors and I I remembered a recipe that fit his palate – tangy and spicy (but not hot). Based on a roasted cauliflower salad that Chef Susan makes at work. 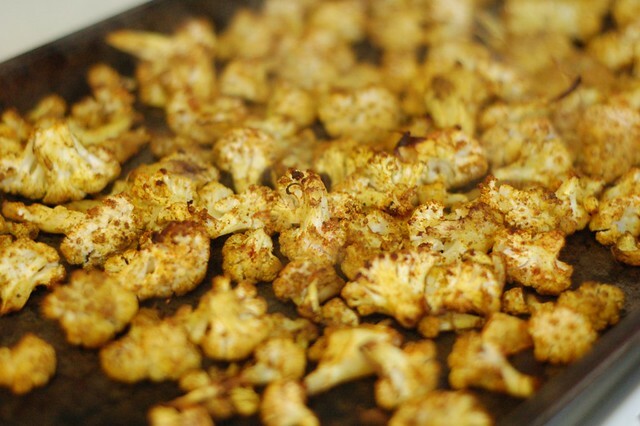 Place cauliflower florets into a large bowl. Cut potatoes into chunks no bigger than the larger florets. Add 1/2 tsp salt, garlic, paprika, and curry then stir. Pour in the olive oil, toss, then spread on the jelly roll pan sprayed with olive oil spray. Roast for 20 minutes at 450F, then furn with a spatula. Return pan to oven and roast for 10 more minutes. Cauliflower and potatoes will begin to brown and soften. Cool to room temperature. While the vegetables are cooling whisk lemon juice with 1/2 tsp salt until salt dissolves (I just put it in a glass jar and shake it). 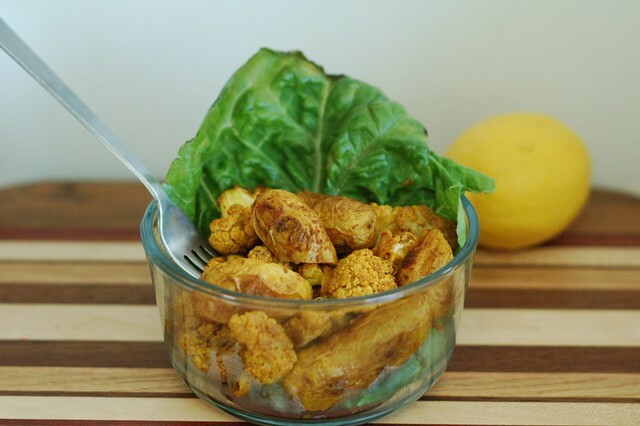 When ready to serve toss cauliflower and potatoes in a bowl with the lemon juice. In the winter nothing comforts me like the flavor of curry. 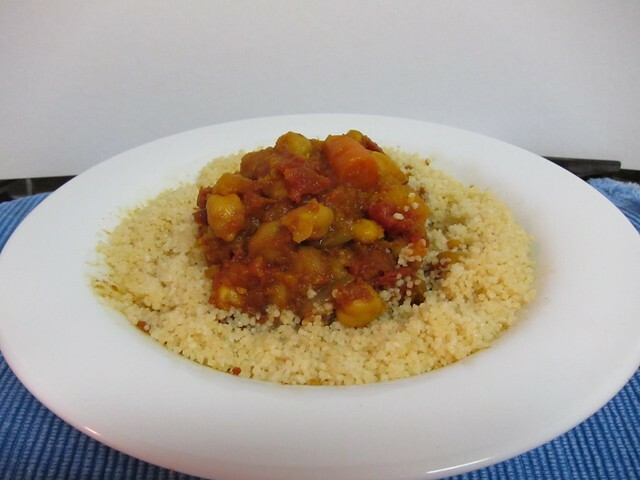 My crock pot butternut squash curry would be a nice hearty Meatless Monday meal. Technically, it’s Spring. But you wouldn’t know it by the weather in our backyard. I’ve been craving this soup and finally gathered all the ingredients to make a big batch. Based on a recipe from Sunset Magazine from 2003, I’ve modified it to fit our tastes. 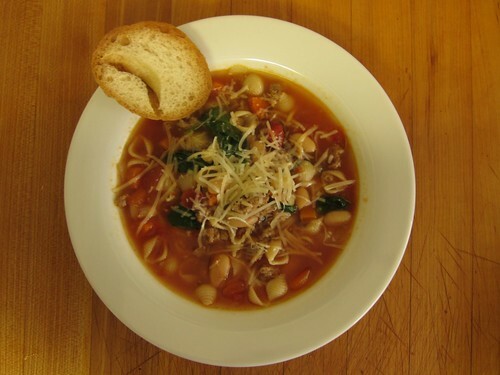 This soup freezes very well, just don’t add the spinach until you’re ready to eat it to keep the flavor fresh. Makes about 5.5 quarts. About 10 servings. 30 oz. 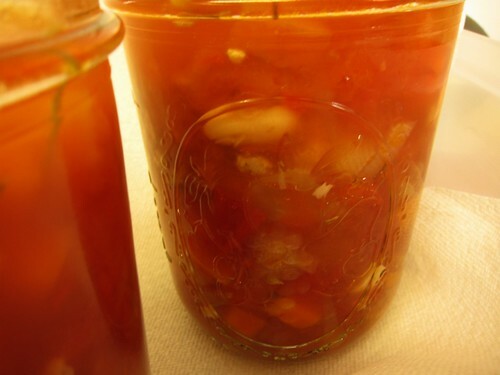 diced tomatoes – I actually use the Pomi tomatoes and use 1.5 cartons. 1. Squeeze sausages from casings into a large (8-10 quart) pan over high heat. Stir often and break apart meat with a wooden spoon until brown and crumbly. Spoon out all but about 1 tablespoon fat from the pan. 2. Add carrots, onion, and garlic, stir often until onion is soft. About 5 minutes. Add broth, tomatoes (including juice), beans and 1 tablespoon rosemary and bring to a boil. 3. Add pasta, reduce heat and simmer. Simmer until pasta is just tender. Skim and discard any fat. Add remaining 1/2 tablespoon of rosemary and salt and pepper to taste. 4. Add spinach and stir until just wilted – this only takes 30 seconds or so. Ladle into bowls and top with grated parmesan cheese. Thaw overnight. Bring soup to a boil and add fresh spinach until just wilted.